Career and reputation take top draw this month, and your drive to reach that pinnacle can stem from a desire to have more of the good things life has to offer. That’s okay, especially if the price you pay makes it truly worthwhile. Burning the candle at both ends may bring accomplishment, but you’re subject to burnout if you fail to allow time to regroup. Overindulgence is also a big temptation, so watch your rationale before you ask to see that dessert cart! Secret fantasies crowd your dreams, and your desire to experience something deliciously different in the realm of romance can prompt you to try something daring. Concern about what people will think may prompt you to cover your tracks, but from June 14 to 20, and during the Moon on June 28, it’s just plain difficult to say no to your desires. You’re inventive — find a way to make it happen! Professional associates provide just the boost you need, and lending a helping hand to someone you respect has its own rewards. 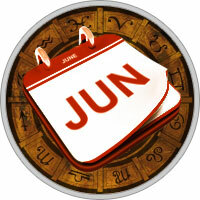 Be clear about your expectations from June 6 to 12, or you may end up promising more than you intended. This is not a good time to make risky investments, either. Pay back old debts after June 18, because you’ll want the freedom to consider new ventures later. You’ve heard it before: It’s not what you know, it’s who you know. The truth of that statement resounds loud and clear this month.